Imagine living with and sleeping in the same room with a person you might not know, sharing a bathroom and closet, and having little to no privacy — all at a price that can exceed the cost of tuition. This is the living situation many college students are facing. 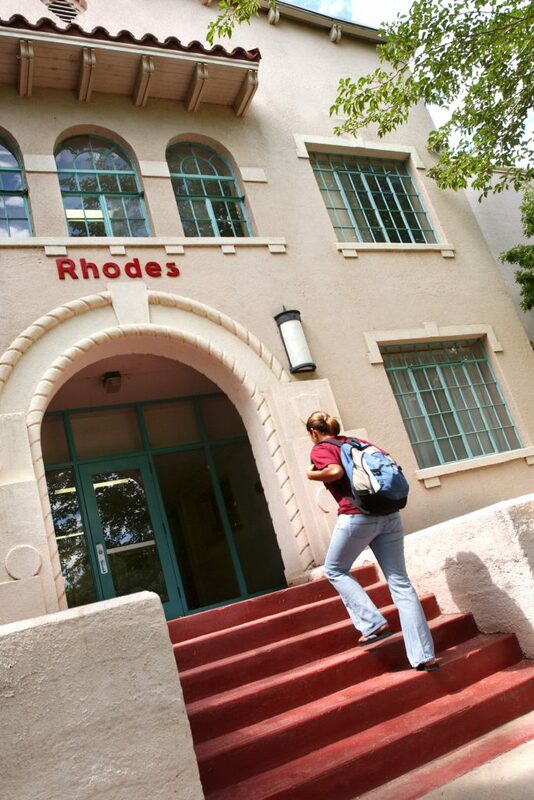 For incoming, out-of-town freshmen at New Mexico State, living in a dorm is mandatory. The cheapest option for on-campus living is a double-occupancy room with a community bath in Rhodes Garrett Hamiel at $3,900 for the 2018–2019 academic year. Prices vary depending on the residency or apartment building, suite bath or community bath, or double occupancy or two or four bedroom. The most expensive on-campus living option is a private, two-bed, one-bath apartment at Vista Del Monte ringing in at $8,000 per academic year. “I think the dorms are way overpriced considering what you don’t get. You share a room with a roommate, who is also paying the same price, and you don’t even really get a bathroom to yourself. It’s not like there is a kitchen in your room, either. We’re paying more for less,” Nava said. The dorms do, however, include all utilities, cable TV and high-speed internet. Also, the close proximity to campus can be convenient, especially for those who do not have their own transportation, such as Nava. Another positive aspect of living on campus is it allows students easier access to on-campus activities and events. Geary said students who live on campus become more focused because they are surrounded by resources that are right on campus and can home in on their education. Despite these advantages, many students choose to live at home with their parents or with family members instead of living on their own or on campus. This alternative can help save money because the students in these situations often do not have to pay rent or even buy groceries in some cases. Living at home not only saves money, but it may help the student stay on track and gain emotional support by living with a parent or family member. Lauren Tellez, a junior at NMSU, has lived at home since she was a freshman. “I love not having to pay for laundry or groceries. I like never being alone and always surrounded with my family. Also, when I’m sick, I’m at home with my mom taking care of me,” Tellez said. Living at home also has its cons. In addition to delaying graduation, it often leads to a lack of socializing with other students, less involvement in on-campus activities and less independence. Living at home can also make it harder to leave home after graduation. These apartments target college sophomores, juniors and seniors. The goal is to promote more independence among students while still having the college living experience. A two-bed, two-bath apartment at The Verge currently runs $595 per person per month, but it will be lowered to $575 in fall 2019. For a three-bedroom, three-bath apartment, the rental rate is currently $500 per person, but will be lowered to $460 per person in the fall. There are additional off-campus options for students. Sidney Sammons, an NMSU sophomore, shares a house with three friends in the Sonoma Ranch area of Las Cruces. “A friend of ours is a Marine stationed in Oceanside, but she invested in this house and we’re essentially paying the mortgage. It’s far cheaper than any apartment or dorm,” Sammons said. According to Sammons, she pays $225 per month, which is her share of the rent in a house that has four bedrooms and two and a half bathrooms. In the end, housing can be tricky for college students because they have to find a balance between what they can afford and what they are willing to give up. CORRECTION: A previous version of this story mistakenly indicated the room and apartment rates for RGH and Vista del Monte were per semester. The rates listed in the article are for the entire academic year. Those rates are per ACADEMIC YEAR, not per semester! Thank you for bringing the error to our attention. We have corrected the room pricing information originally contained in the article.